Note Worthy Preschool Carpet 5'4"x7'8"
Image does not reflect actual size. See dimensions below. The warm, inviting colors in this Noteworthy carpet make it the perfect addition to any music room. 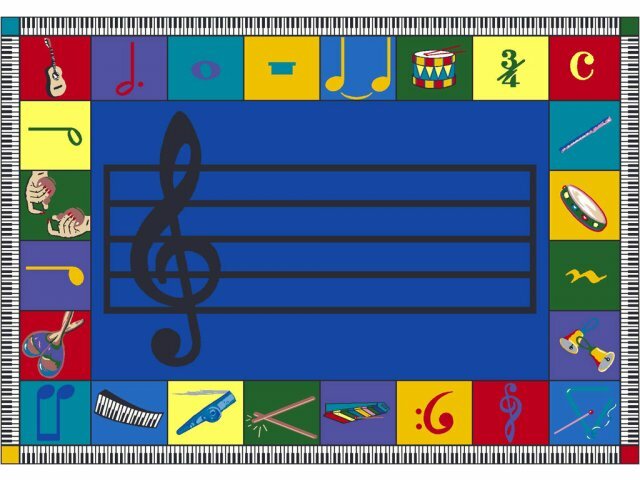 Children will enjoy learning about the various musical symbols, note matching, and even simple and complex rhythms through games galore that can be played around the border and inside the treble clef. 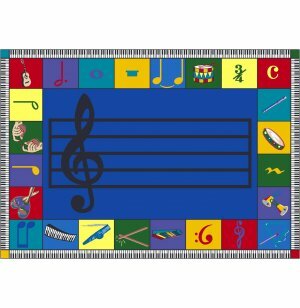 For quiet singing time, young students can sit on the musical symbols with the teacher in the middle, giving kids a wonderful start on a lifelong appreciation of music. First quality materials, safety features and design all come together in Joy Carpets' educational products. Their wide selection of school carpets and mats come in delightful designs that actually teach kids as they use them. This process consists of spraying a solution of water and detergent into the carpet pile and recovering the water and soil with a powerful vacuum into a holding tank. Manufactured with Stainmaster® Carpet Technology. Certified CRI Green Label Plus for indoor air quality. State-of-the-art injection dye technology ensures vibrant colors and outstanding fade resistance. Softflex™ elite secondary back minimizes wrinkling and promotes longer carpet life. Double-stitched serged edges for maximum durability.